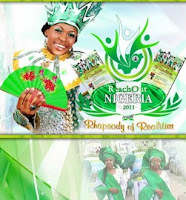 Nigeria is celebrating her 51st year of Independence Anniversary on the 1st of October 2011. Reachout Nigeria campaign; a Christ Embassy church reach out campaign program with the world #1 daily devotional. Several millions of copies of Rhapsody of Realities daily devotional are being freely shared to commemorate the Independence and to bring hope, and give meaning to lives in Nigeria via the Word of God. This year 2011 is promised to be greater than the former by His Spirit.